Pasta is my all-time favorite and Yashvi isn’t behind in the taste as well and so pasta in any form and at any time is always welcome in my home. It becomes all the more welcoming if pasta can be turned into super healthy meal with huge nutritional value and yet big on flavors. Keeping these facts in mind I proudly share Vegan Red Chard Fettuccine recipe with you. 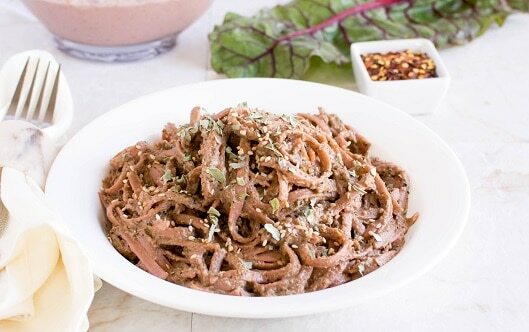 The wonderful pinking color of red chard sauce and its delicious nutty flavor when tossed in whole wheat and flax infused healthy fettuccine pasta tasted out of this world and we happily indulged in it guilt free. It took me only few minutes to prepare the sauce and trust me it was pure creativity while making this sauce because I wanted red chard sauce to be exactly the same way as I had imagined and to my delight my imaginations came out true and made me super happy. I simply assembled all the ingredients of Red Chard Sauce in a blender and blended smooth. My idea was to make a quick and easy yet exquisite sauce for this pasta recipe. In a food processor/blender combine all the ingredients for the sauce and blend smooth until light and creamy. Heat oil in a pan and add Italian seasoning, oregano, onion powder and mix these herbs in the warm oil. (Do not let the seasonings cook too much). Immediately add the cooked fettuccine and toss very well. Now pour the prepared red chard sauce and toss very well until the pasta is well coated. Mix in salt and pepper and serve warm. Blanch the chopped red chard in about ¼ cup water for a minute. Do not throw the water and blend it with the sauce ingredients. Make sure blanched red chard is completely cooled before blending. Measure Red chard after chopping and before blanching. This red chard sauce should be thick and creamy in consistency and tastes excellent as is. However, while tossing fettuccine in the this sauce you feel it’s too thick for you to mix then add ¼ cup of more almond milk to it while tossing and adjust the salt according to taste if desired. For this recipe I used whole wheat milled flax seed Fettuccine keeping in mind the health aspect of this recipe. Feel free to use any Fettuccine pasta of your choice. This recipes yields 1 ¾ cups of red chard sauce. Toss in Fettuccine when ready to serve or else the pasta will absorb all the sauce. The red chard sauce cane me made ahead of time and can be refrigerated in a glass container for 2-3 days. Your Vegan pasta looks great. Never used cashews in my pasta before will have to try it. Pinned.